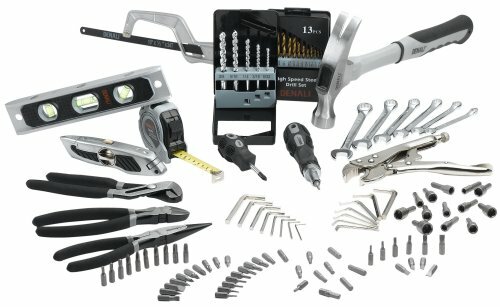 This kit includes all of the tools you need for just about any household chore, from hanging pictures to fixing a leaky faucet. They are of good quality and should handle all of your household chores and repairs for many years to come. Going through this kit, I really appreciated little touches rarely seen in basic tool sets, like the soft-grip rubber cover on the tape measure that makes it easy and comfortable to hold, and the dizzying array of bits that come with the ratcheting screwdriver handle. But what’s really brilliant is that all of these tools come in a heavy-duty nylon bag. Most tool sets come in big, flat blow-molded cases that can be awkward to store and carry. Plus, some tools invariably fall out when you open the case. That’s why most professionals, after buying a tool set, will throw away the case it came in and go out and buy a separate tool bag or chest to store their tools. 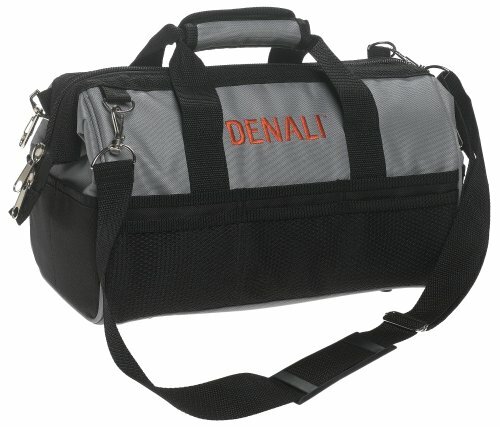 The Denali kit’s bag fits easily under a sink cabinet (it actually is the size of a breadbox), and has both a shoulder strap and hand-straps that Velcro together, making it easy to carry around. The mouth of the bag has metal stabilizing rods in the zipper, so it opens wide and stays open, meaning you can set it down, and easily get to any of the tools inside while you are working. There are a ton of pockets lining the inside and outside of the bag to carry little things like nails, screws, tape, picture hangers—all of the little things that seem to crowd your kitchen drawers. This 16-ounce ripping hammer with heavy duty fiberglass handle is a medium-weight hammer that will handle most household jobs, with claws for pulling nails. A good sturdy level is a must for hanging or straightening pictures, checking tabletop alignment, or mounting towel bars and curtain rods. This 9-inch, aluminum model is accurate, lightweight and easy to handle. The 3/4-inch wide by 16-foot long tape measure has a thumb lock, metric and English markings, marks for placing studs every 16-inches, a belt clip, and a soft-grip rubber shell that makes it easy to grip and comfortable to hold. These are also called Allen wrenches. The kit comes with 8 in metric and 8 in English measurements. 7-inch nickel-coated locking pliers are essential for getting a good, solid grip, especially when working in small spaces that don’t allow you to grip with your full strength. Wow, you’d never imagine needing a star-drive screwdriver, until you buy that fancy new European dishwasher. 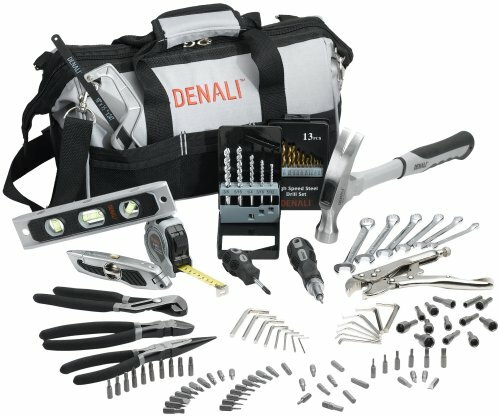 Denali’s kit includes a ratcheting handle with a selection of interchangeable bits to provide an exceptional array of screwdrivers in all sizes and head shapes. The ratcheting handle is a nice feature, making it a lot easier to drive screws that are upside down or in tough to see places, where you really don’t want release pressure on the screwdriver handle to keep turning it. Poszidriv screws are similar to Phillips head screws, but are less prone to slippage at high torque and so provide better performance when working with air and power tools. Note that Pozidriv screwdrivers are likely to slip or tear out the screw head when used in Phillips screws. This is interesting, since the kit doesn’t come with a drill. The manufacturers apparently assume that either you have a cordless drill and will appreciate a couple of good bit sets, or that if you don’t have one, you should get one. They’re right. If you don’t have a good, basic, cordless drill, you’ll appreciate it when you do. Check out Amazon’s selection of cordless drills. 50-piece chrome vanadium steel 1-inch screwdriver bit set can be used with either a cordless drill or the ratcheting screwdriver included in this kit.